When the French one-man company Twisted Electrons shipped it's first batch of SID-based TherapSid synths in the fall of 2014, some users experienced 'stuck notes' and MIDI-trouble but Alex seemed to react swiftly and accurately. 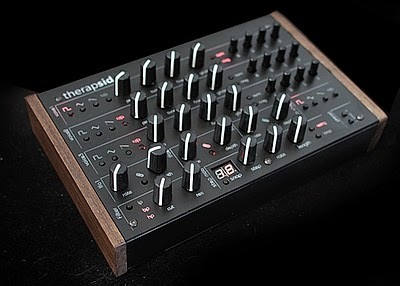 And so, by january 2015 the € 399,- for a TherapSid (with 6581 chip, or € 333,- without) seemed a justifiable investment. Long story short: the monster has matured quite a bit. Don't be stupid ~ NSA, CIA, Google, Apple, Facebook etc. The Dubbhism blog uses a Google service, called Blogger.com. We also use Facebook, Google Search, some i-devices etc. The companies behind these products are ~ in Rastafarian speak ~ 100% Babylonian. A part of the so-called military-industrial complex. If you want to use analog synths/oscillators for xenharmonic music, there are MIDI-based options like the H-Pi Tuningbox, or the more advanced Silent Way soft/hardware. And there are modules like the Analogue Systems RS-130. Or you could also try a hack: maybe it's possible to hard sync your hardware with software-generated audio. OR Combiner will do a mixed media/modular madness set on the 31st of januari at the infamous Noodlebar, this edition at a temporary new location: Triphouse Rotterdam HQ, West-Kruiskade 51. Line up: Kami Kapnobatai (Rotterdam), OR Combiner (Leiden), Zeitdehner (Brussel) and Wouter van Veldhoven (Utrecht). Facebook event over here.